MUHAMMAD ALI HAS passed away, aged 74. Ali passed away at a hospital in the Phoenix area of Arizona after a long battle with Parkinson’s disease, a family spokesperson said. The boxing legend, who was born Cassius Clay, was diagnosed with Parkinson’s syndrome in 1984 but continued in public life until recent years. In 2012, he was a bearer of the Olympic Flag in London during the Opening ceremony, helped by his wife Lonnie. Since then, his health deteriorated with reports in February 2013 that he could no longer speak. Born Cassius Marcellus Clay in Louisville, Kentucky on 17 January 1942, he fought in his first competitive boxing bout in 1954 at the age of 12. Given the title of Sportsman of the Century by Sports Illustrated and Sports Personality of the Century by the BBC, Clay burst onto the national boxing scene at the 1960 Olympic Games in Rome, taking the light heavyweight gold medal. He turned professional that same year – at the age of 18. A steady stream of victories coupled with extreme self-promotion and showmanship saw Ali quickly rise in the ranks of professional boxing. Clay danced and moved like a light-weight, taunting his opponents inside and outside of the ring with lightning fast combinations and witty taunts. Just four years after going pro, at the age of 22, the Kentucky native won the world heavyweight championship from Sonny Liston, a spectacular upset to the sport. Clay hadn’t been given a chance by the pundits, but he danced rings around the older Liston before forcing him to quit on his stool at the end of the sixth round. As well as a formidable force inside the ring, Clay was politically active and a strong opponent of the racism that besetted America at the time. He joined the Nation of Islam – a civil rights movement that called for the development of black people as separate from whites. 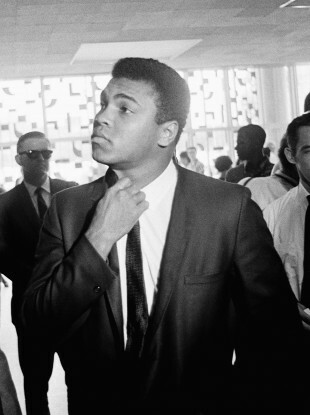 Clay soon converted to Islam and changed his name to Muhammad Ali. His divisive political stance and brash manner made him somewhat of a hate figure for many Americans – with just 2,000 people turning up for his rematch title bout against Sonny Liston in 1965. Ali would defend his title 8 more times but was stripped of the belt when he refused to join the American army fighting in the Vietnam War. Ali was sentenced to five years in jail, but had the conviction quashed on an appeal. He was eventually allowed back to fight in the ring – three years after he was suspended. The years of absence had slowed the legendary boxer down somewhat, and he lost the first bout of his career to Joe Frazier in 1971. Ali would go on to fight Frazier two more times and win both days in brutal protracted battles that lasted many rounds. After a title fight against Frazier in 1971, Ali said it was the closest thing to death he had ever come. But Ali’s most famous bout came against then-champion George Foreman in 1974 in the “Rumble in the Jungle” title bout. Ali wasn’t given a chance against the younger, hulking Foreman, but after leaning back against the ropes for the first eight rounds and absorbing Foreman’s blows, Ali bounced back and delivered a little combination – sprawling Foreman to the mat. At the of 32, Ali had regained his heavyweight championship title. He would go on to lose the title to Leon Spinks in Las Vegas in 1978 and regain it eight months later. By now, however, Ali was fading as a fighter, and lost a couple of bouts before retiring in December 1981 at the age of 40. His final boxing record is an impressive 56 wins out of 61 fights, which included an incredible 37 knockouts. Email “Boxing legend Muhammad Ali has died, aged 74”. Feedback on “Boxing legend Muhammad Ali has died, aged 74”.